Preparing for Adulthood is the 5 steps and 4 pathways to help young people set and realise their aspirations for the future. The Local Offer supports young people to do this by presenting the opportunities and support available. All the pathways above will be addressed for young people with SEND to ensure they can live healthy, productive, independent and fulfilled lives in our community. The Local Offer and the young person’s Education, Health and Care plan will support them to realise their goals. What is “Preparing for Adulthood” all about? Young people with SEND should have equal chances as they move into adulthood. Preparing them for life as an adult and establishing their goals is essential to ensuring they have a good quality of life. 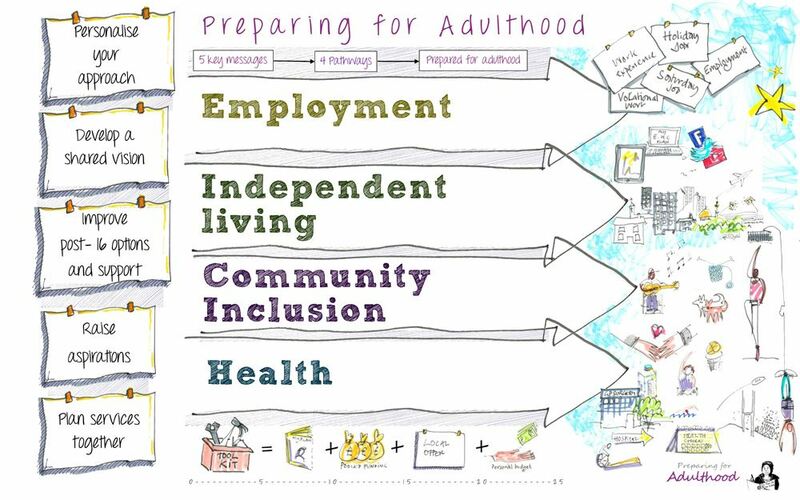 Preparing for Adulthood identifies 4 pathways that young people should pursue: Employment, Independent Living, Social and Community Inclusion, and Health and Wellbeing. These should be addressed in the young person’s Education, Health and Care plan from the age of 13, with long term goals identified that can be worked towards. ‘Preparing for Adulthood’ is the term used for the framework of support given to young people to prepare them for their new responsibilities, new experiences and new challenges on the next stage of their education, training and employment. Everyone has a part to play in preparing young people for adulthood. For example raising their expectations to achieve the best possible outcomes in education, focusing on employment, independent living, participation in the community, and taking more responsibility for their health and wellbeing. Who is ‘Preparing for Adulthood’ for? Preparing for Adulthood is an initiative supported and funded by the Department for Education to help prepare young people with an Education, Health and Care Plan for the transition from education to adult life, work and independence. Your EHCP Review meetings in years 9, 10 and 11 will include ‘a section on Preparing for Adulthood. This will help set aims and plans for your post 16 options. Teachers, parents, carers and others working with you will help you to set your goals and prepare for ‘Adulthood’. What funding is available to support young people with SEND at college? What information is there to help me after year 11? Your reviews and careers education should have helped you set goals and plans to reach them for when you finish secondary school. If you have an EHC plan, this should identify where and what you are going to do after year 11. For more information follow the link to the SEN file and the Guide for young People to Post 16 Transition. What do I need to think about when I transfer from secondary school to a new setting? See our useful Preparing for Post-16 provision - one page summary detailing how to support transition planning for secondary school pupils. This also outlines important review meetings for Year 10 pupils to prepare them for transition to post-16 settings.